Ordered set of Goodyear 2932 Landspeed tires 28 x 10 -15. $255 each A lot less than the other Landspeed tires. They are used for Can-am and Nascar racing so they make more and must be reason for less price. Ordered about 1:30 from Carroll Shelby Int. in Las Vegas and shipping out today. Not happy with some of sleeves installed in motor after repair '' etched in different places from sitting after water injection. thought we dealt with potential problem by spraying a bunch of WD 40 into intake while running motor after run but figured out to late that intercooler still had water injection in it, so mixing with WD. Will take plugs out from now on and squirt a bunch of oil in cylinders and turn over with starter several times. Anyhow we needed to replace 6 sleeves,'' $600 + but I thought I had some 4.187 sleeves in a crate some were. Troy was out and we found them right away. Newspaper wrap says 2002 6 sleeves I bought thru National Dragster. Years ago had plans to build an A motor at 482 cu in got a Kieth Black 5/8 stroke crank and 4.187 pistons then A class was changed to 500.99, so now 5/8 stroke ''4.375'' crank and 4.250 bore and 496 cu in. Shocked to find tires at front gate as we were leaving about 11:30 this morning. UPS must have left them after 5:00 pm yesterday. Gate sits back from road but tires were visible if anyone looked up and over. But I can be standing 30 ft back, in the middle of driveway, and most drivers never see me. Also took crank in to have magnefluxed and checked out,especially journal where we broke the rod. He couldn't believe we lost a rod as it looks just as the other journals, He says well it broke above the cap, ''yea but the rod cap was broke with part of it missing and we had to saw it apart to get it off the crank because the one bolt that was left was so buggered up a socket wouldn't fit"
Tomorrow we try to get sleeves out. They can be a real bear to get out as these newer blocks have tighter sleeve bores. 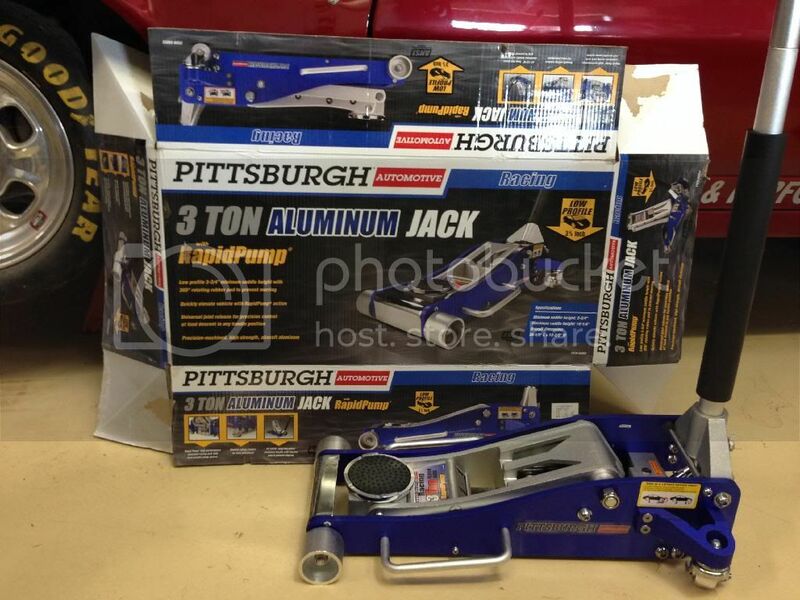 And we don't have the heavier slide hammer that you see them use at the drags. Sleeves not happening today. Grand daughter Peyton's volleyball team needs help from her dad. A couple of new toys to share. Our old jack was heavy, old and rusty. Our new one is the opposite! I have a pair of 27.5x10-15 Goodyears; must be similar. 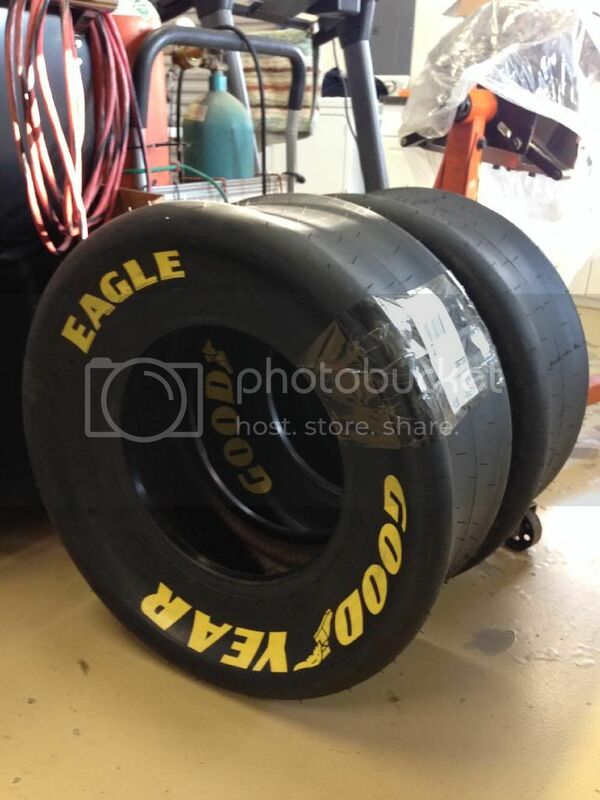 I scored a pair of NASCAR Goodyear rain tires a few months ago. Yep-- NASCAR rain tires! Unfortunately, my car won't get close to 300! From what I've read, Goodyear built rain tires for only a couple of events where rain was likely. The teams were supposed to turn those tires back in to Goodyear after the event so I don't know how this pair got away. They might be better than slicks on the salt, too. We'll see. Saw a lowered diesel truck at Bville, mid or regular size, with giant rain tires, at least 12'' wide. Never had a chance to talk. After crank snafu, I was worried that UPS had dropped off rods and pistons at front gate and someone had snitched them, so called and checked order. Just a hair brain thought about Rob's comment about the wide tires starting to float above 250 mph. Tires do generate lift and it is related to their width so I wonder if maybe on the Corvette the speed that the tire lift was sufficient to start degrading traction was the 250 area. Just a thought.